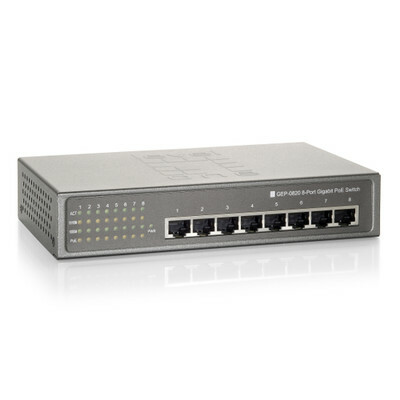 The 71X6-00308 offer advance switching and provides power to network devices using Ethernet cables. This scalable and cost effective solution allows a managed network to efficiently expand to previously unattainable levels. The 71X6-00308 offers PoE technology, conveniently eliminating the need to install networked devices, such as IP cameras and access points, near a power outlet, thereby reducing equipment and installation costs. The 71X6-00308 enables users to deploy a stable and reliable high-speed LAN environment, with store-and-forward switching architecture, the 71X6-00308 provides a stable and reliable packet error filtering and nonblocking packet forwarding architecture. The device supports N-way auto-networking speed and duplex modes. More Product InfoThe 71X6-00308 is a high-performance 10/100/1000Mbps Gigabit Ethernet PoE Switch. All 8 of the PoE Ports are powered up to 15.4W. The total PoE power budget is 61.6W. This switch automatically detects IEEE 802.3af compliant powered devices and provides power and data over a single cable. 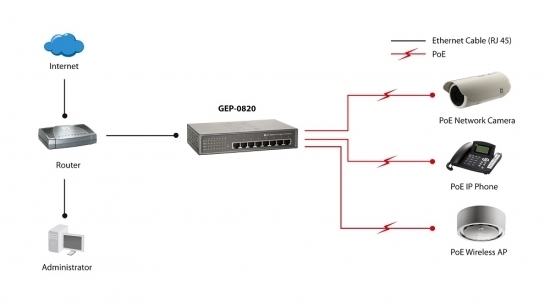 It is an ideal solution for office and home users to utilize a combination of PoE and non-PoE devices.